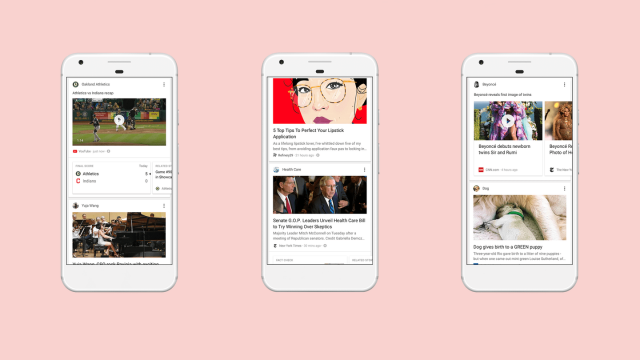 The latest technology news is feed, Google’s latest release..
Google feed is Google’s new mobile newsfeed. Google feed is a personalized news feed. The feed appears below the search bar on mobile devices using the Google app. It shares news, sports, weather, movie listings/reviews, and more. What is shown is all based on your search history and interests. Do I Need to Optimize For Google feed? Google feed isn’t going to be a necessary platform for every site to try and rank for. There is a definite upside in feed’s focus on relevance and personalization. This means people who see your stories will be more relevant and more likely to visit. On the other hand, competition will be tight and it may not be worth having a specific focus on optimizing for feed. Some industries have more reason to compete for feed position than others. For example, news sites, sports, and content distributors should absolutely be trying to rank for Google feed. These are at the crux of feed’s functionality. And being shown on this platform will up your exposure to readers looking for content like yours. There is no downside to trying to optimize your SEO to rank on Google feed. The requirements are in line with what you need to create successful SEO content in 2018. So your other SEO efforts will not suffer. 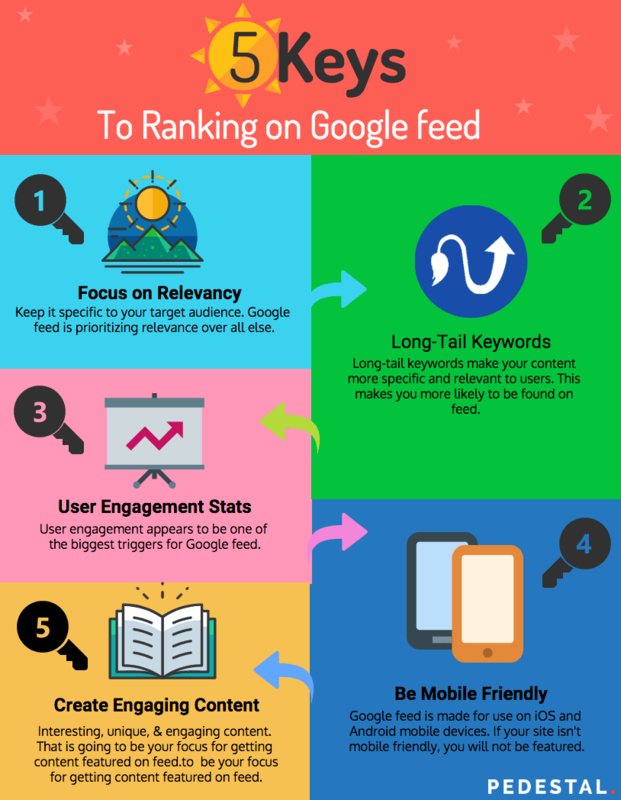 Ranking on Google feed requires an understanding of smartphone search habits and micro-moments. The main micro-moment that feed serves is, “I want to know.” Feed appears before a search occurs. So this is a chance to draw a reader in by giving them something they want to learn more about. In trying to rank on Google feed, articles that position themselves as infotainment can do well. You have the advantage of already being shown to someone who is interested in your topic. Your job now is to entice them to click through. You need a topic matter that is interesting, on topic and stands out. Having exclusive information or an original take on a subject will drive higher reader engagement. Next to relevancy, reader engagement appears to be the most important ranking signal for feed. In most cases, all that will be shown is an image, the article title, and the meta description. So it’s important you have these in place. Having your title contain SEO keywords is not nearly as important for feed as having it entice the reader to click-through to the article. That said, the title still must be relevant to the article. For meta descriptions, keyword use doesn’t really matter as much even outside of feed. The value of meta descriptions is in their opportunity to convince readers to click thru. It is your chance to entice the reader in one or two sentences. Google feed is available on iOs and Android. For now at least, it is made exclusively for mobile use. If your site is not mobile friendly you are unlikely to appear on feed. Using rich snippets is important for appearing on feed, as they match the platform’s functionality. It is likely that they will become more important over time since they will likely have higher engagement. 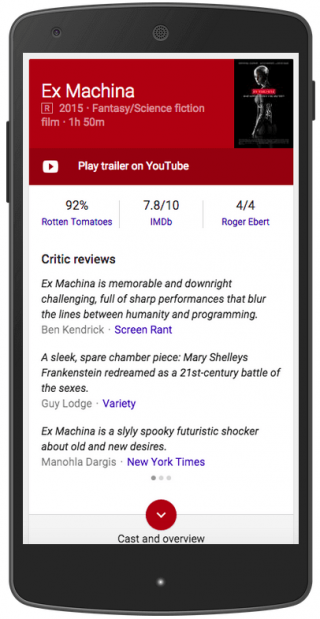 For example, a movie review site using an applicable snippet will have a more favourable appearance on feed. A relevant and enticing image is one of the main selling features your article will have on feed. The image should be easy to see as a thumbnail as it will not be shown in its full size. Text on the image should be minimal if used at all. 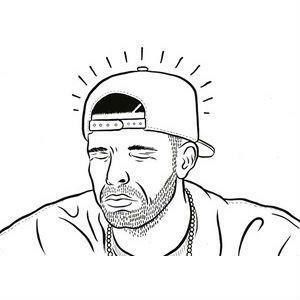 Right now feed is not video-heavy. The videos that are there redirect you off page, instead of playing directly in feed. It is possible that this is in order to reduce feeds load time. It is likely that this will change in time. But for now, video does not seem to be the best way to get found on feed. This is one of the big differentiators between Google feed and newsfeeds from Facebook and Twitter. Facebook and Twitter place a higher value on newness. Google feed is all about relevancy. So an article can be shown that is several months old, so long as feed thinks it is most relevant to the user. Creating content with lasting power as opposed to one-off pieces may help you get a leg-up on feed. Google feed is not influenced by your friends’ likes, shares, or interests. Google feed is not influenced by your friends’ likes or shares. All you see is what is most relevant to you, based on your search history and interests. Preference appears to be given to articles that are relevant to you and have good user engagement stats from similar users. This is great for SEO purposes because it increases the relevancy of your audience. So you will likely see more qualified traffic coming from feed. This will only increase with time, as the feed becomes more personalized over time. Users can follow topics and subject matter to make their feed more specific to them. In the near future, it is anticipated that they will also be able to follow specific publishers. The focus on relevancy makes one thing apparent. Long-tail keywords will be paramount for SEO writing. Long-tail keywords are keyword phrases, three words or longer. They are very productive keywords for SEO as they are more specific. This means your traffic quality is better. There is also less competition so they are easier to rank. Search volume can be lower, but it will be more relevant. So How do I Rank on Google Feed? Google has been making a big effort to be more predictive. They are finding ways to try and satisfy users before they can even type a search query. Recent works such as Google Assistant improve search functionality through voice search. Now, Google feed is anticipating what a user may want. Learning how to rank on digital assistants, Google feed, and upcoming technologies will be important for the future of search. All signs point to a search future that is focused satisfying user needs and user experience. Effective content will be user-centric, instead of writing from the side of the product or service. Discover more about forward-thinking search marketing. Toronto’s best SEO & PPC services, position your business for success & growth online.